Good Choice Reading: Falling Kingdoms QUEST blog tour! Falling Kingdoms QUEST blog tour! Welcome to the Falling Kingdoms QUEST blog tour! Hidden in each tour stop is the answer to a Falling Kingdoms trivia question. 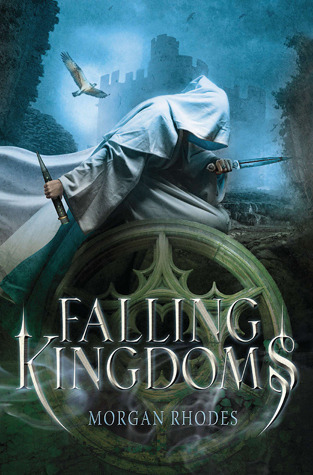 Email the answer to yrmarketing@us.penguingroup.com with Falling Kingdoms Blog Tour in the subject line for the chance to win one of FIVE hardcover copies of Falling Kingdoms! The more questions you answer, the better chance you have to win! QUESTion: What material is the Auranian castle built from? From Morgan: The name “Auranos” is inspired by the Latin word for gold (aureus). Auranos is the rich and prosperous southern kingdom in the land of Mytica. The castle itself is in the center of the walled palace city known as the “City of Gold.” The Auranian castle is built with stone that glitters like precious metal under the sun. Auranians wears their privilege on their sleeve for all to see – but it’s more from ignorance of how they’re being perceived by those less fortunate than a true need to show off. Auranos boasts plenty of wildlife and agriculture that their poorer neighbors in Paelsia envy and try to poach by crossing through the dangerous Wildlands forest that separates the two kingdoms. Your average Auranian might not be a super rich noble, but he or she certainly isn’t going hungry. At one time, Auranians worshiped Cleiona, goddess of fire and air—in fact, their current princess is named after this powerful goddess. But laziness, hedonism, and a lack of religious direction from their current king has made religion a much smaller part of their lives than it was in the past. Tomorrow, head over to Romance Junkie Reviews to find the answer to your next QUESTion, then email the answer to yrmarketing@us.penguingroup.com for a chance to win a copy of Falling Kingdoms! 11.27 QUESTion, found somewhere in the Romance Junkie Reviews tour stop: Where are most villages in Paelsia found? Lil Berry - I had trouble finding it too. On Romance Junkies - once you hit enter and are on their home page - Below What's New - you need to click on "Check out the RJ Blog" - That'll take you to the Falling Kingdoms Post.